The SSEF's capital campaign in 2015-17 provided funds for a new Fitness Center. The Center is located at the south end of the high school, in close proximity to the athletic fields, gymnasiums and locker rooms. The 6,200 square foot facility includes two designated areas for strength- and cardio-training, and a separate area for stretching, floor exercises and group instruction. The Fitness Center serves physical education classes, athletic teams and individual students. The facility accomodates use by two physical education classes at a time, as well as before and after school programs and off-season use. As a result, we now have a modern and inclusive Fitness Center, in a better location and with vastly improved space and equipment to serve the entire student body of the school. A larger and better-equipped Fitness Center at the High School is essential to the implementation of a successful physical education curriculum that students will find engaging and meaningful. An improved and more inclusive space is also necessary to meet the needs of athletes and teams, and to provide gender equity consistent with Title IX. 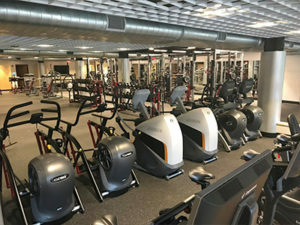 The Fitness Center opened in October 2017, jointly funded by the Scarsdale Schools Education Foundation and the District, as well as by a generous gift for equipment from the Madoff Family of Scarsdale. 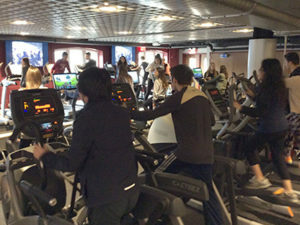 The Fitness Center is designed to be a resource for the entire student body. Scarsdale’s K-12 physical education curriculum has been redesigned in response to a new set of learning objectives defined by the National Association for Sports and Physical Education. The goal of the new curriculum is to develop physical skills, positive attitudes toward fitness, and an appreciation for the value of collaboration and perseverance. Consistent with current research and practice, the curriculum now includes a focus on lifelong fitness, sports and activities. A modern training facility is also essential for our current athletic program. Increasingly, interscholastic athletics requires participants to be involved in strength training, conditioning, and health education. Effective training is essential to minimize injuries, facilitate rehabilitation and protect the safety and long-term health of participants. In Scarsdale, a larger, more open, and more accessible fitness center is especially important in our efforts to meet the needs of female athletes, who were not comfortable using the previous, outdated and unwelcoming, weight room.